Sign Up for free to save time shopping State Flower Cannabis's wholesale products on LeafLink. 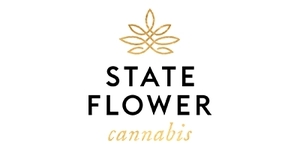 "Cannabis Is Our State Flower"
Started from the relentless pursuit to grow truly exceptional flowers, State Flower evolved from a boutique approach to cultivation into state-of-the-art operations, while maintaining an ultra-premium level of quality. As the cannabis industry transitions from its humble roots, we are proud to be leading the way into this new phase of professional standards and practices. We grow hydroponically, indoors, feeding our flowers a proprietary blend of bio-mineral nutrients and beneficial microorganisms. Prior to harvest, plants are flushed for two weeks with pure, clean water. Then, after slow-drying for two more weeks, each batch of our flowers are dry trimmed by hand and carefully cured. State Flower Cannabis is proud to be the first California Envirocann certified cultivation. Envirocann tests every stage of growth in our cultivation process (not just finished flowers) to certify that our cannabis is free of synthetic pesticides, PGRs, and that sustainable practices are employed in our facility.